It is the players who are the main attraction of any sport driving all the spot light towards them. Infact, the more a player stays in the headlines the more successful he is deemed. After all for players, no publicity is bad publicity. Referees and umpires though critical in any sport often have very different careers. An umpire’s success depends upon staying out of the news or bad news for that matter. If you are to have a progressive career as a professional umpire then the last thing that you can be is biased. But sadly there have been instances in the history of sports, where some irrational, some might call them prejudiced, decisions by umpires led to controversies tainting the spirit of the game. 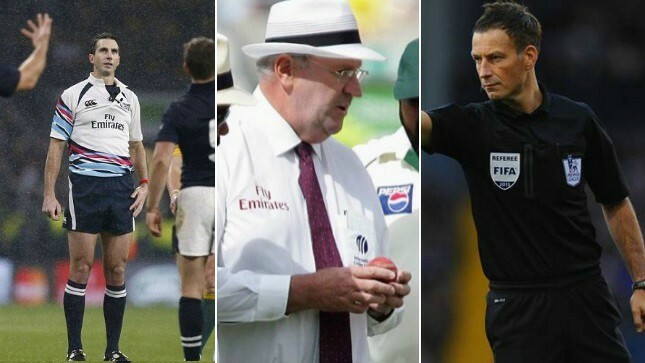 Let us see the umpires who are infamous for stirring controversies. Australian Cricket umpire, Darrel Hair, had a niche for giving decisions which didn’t settle well with everyone. This is the same umpire who once declared every ball delivered by SriLankan legend, Muttiah Muralitharan, a no ball and sighted his awkward action- illegal in his views- the reason for that. But what led to Darrell Hair’s demise is the battle he picked up with Pakistani Batting Great, Inzimam ul Haq. In the summer of 2006, Pakistan visited England under Inzimam’s leadership for a 4 test series. ICC had nominated Darrel Hair as the field umpire for 4th test of the series. Now Hair had been perceived as someone who held bias against Asian teams so naturally Pakistan Cricket Board had in past privately expressed their disapproval of nominating Darrel Hair as a match official in any of Pakistan’s game. Well, everything was going all fine until the 4th day of the Oval test when things went so haywire that the match had to be forfeited. Right before Tea session, Darrel Hair accused Pakistani team of using unfair means in preparing ball and making it conducive for reverse swing. Infuriated by the allegations, Pakistani team registered its protest against Hair’s decision by refusing to take field after the tea session. After waiting for 2 minutes, Hair forfeited the 5 day game in England’s favor. 25 minutes later Pakistani team took to the field and even English team was willing to get on with the play but Mr. Hair remained adamant that the match had already been forfeited. Never in the 1000 match history of cricket had such incident ever occurred before. 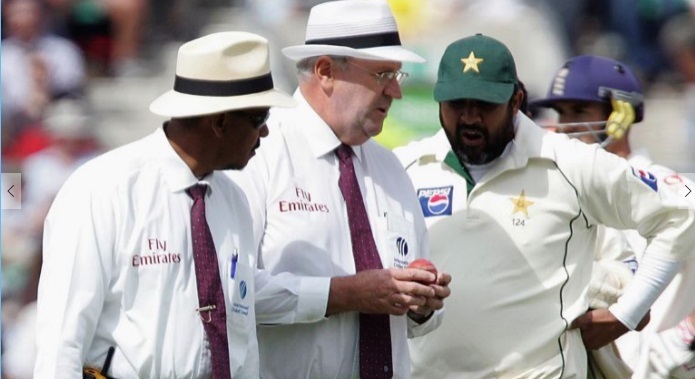 ICC initiated an inquiry which absolved Pakistani team of all kinds of ball tampering and Mr. Hair was banned from officiating in any of the future ICC events, a decision which was very received amongst the Asian Cricketing nations. “Disgraceful” and “Indefensible” are the two words which are often used while examining this referee’s decisions. Over the course of his career, he has committed all sorts of honest mistakes and genuine blunders. From hitting a player in eye with a flag to reviewing a play which wasn’t even review-able. He has done it all. But what is worse is that he is still oblivious of the rules of the game he is officiating in. How is that for swag? 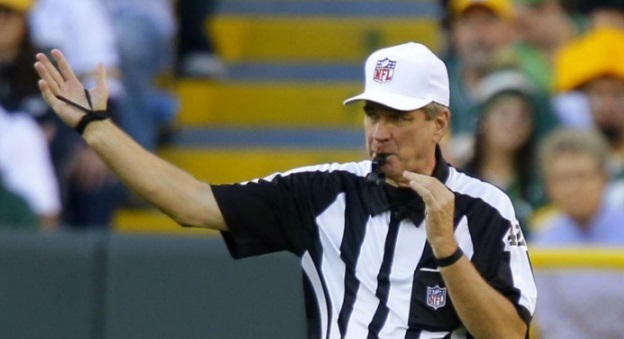 Mr. Triplette is unaware of rules which even the fans of American Football are aware of and we are not surprised for him being known as the worst NFL referee. Scottish people felt robbed of all their dreams and hopes in last year’s Rugby World Cup when umpire Craig Joubert decide to award an unwarranted penalty to Australia in the dying end of World Cup quarter final. Making full use of the opportunity, Australia finished the game with the score of 35-34 and registered a spot in the semis. Match was at a very critical stage and demanded a lot of caution from umpires when Mr. Joubert made his decision. 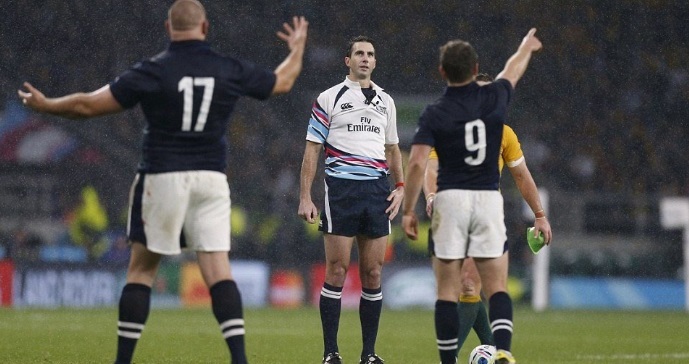 Craig Joubert could have referred the decision to the TMO system but instead he went with his own instincts. Now this is where we fail to develop a consensus. 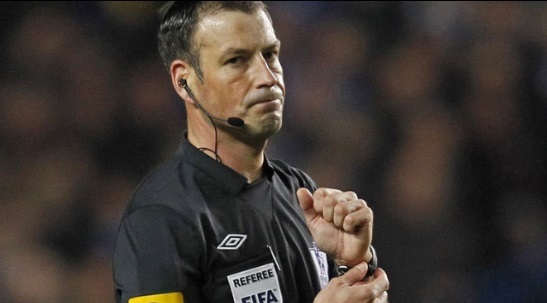 Some would go as far as naming him amongst the best few umpires in English Premier League and some are so utterly displeased of his performance that they don’t need any second thoughts before naming him amongst the most controversial referees in football. Mr. Clattenburg once denied Tottenham a crucial goal against Manchester United when the United Goal Keeper had clearly fumbled the ball across the goal line. At another occasion he went up to the Manchester City bench and expressing his disapproval of City player Craig Bellamy he enquired: “How do you work with Craig Bellamy all week?” Later he showed two yellow cards to Bellamy. He is one referee to steer clear off. A bat umpiring in the middle of the day would do a better job than our Dear Kiwi umpire here. Mr. Llong is notorious amongst the cricketing circles for giving decisions which would make you pull your hair out. In the most recent of cases, Mr. Llong gave reprieve to Australian Spinner Nathon Lyon by declaring hi not out even when the batsman himself believed he was out. And guess what? Mr. Llong was not even on the field that he could get any benefit of doubt for such a blunder. He is was the third umpire in the game with all the technology available to him. Hot spot clearly demonstrated the presence of a mark on the bat which couldn’t have come from anything other than the ball itself. After viewing the replay on screen, Lyon had decided to take the long walk back to the pavilion but his joy and New Zealand’s surprise, Llong declared him not out. 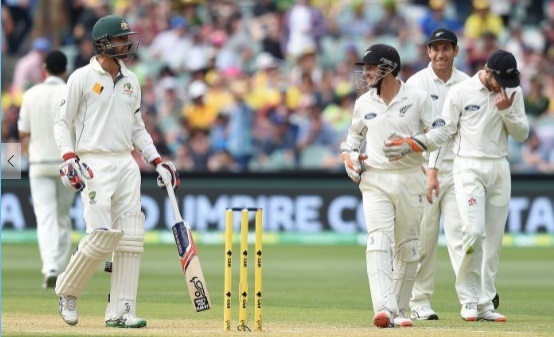 Australia was struggling at 117-8 when the incident occurred but thanks to Mr. Llong Australia ended up getting a lead of 22 runs over New Zealand’s humble 202.